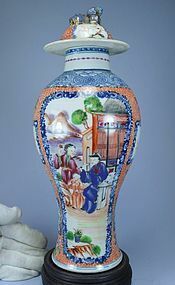 Stunning early Chinese mandarin Qianlong lidded enameled porcelain jar. Beautifully decorated in famille rose style with figural and landscape design in different panels, from late 18th/early 19th century period. Size; Height of this item is 11.6 inches, condition is consistent with age. Provenance: Private collector, Lisbon. 18th C. Chinese Mandarin Enameled Porcelain Bowl. 18th C. Chinese Mandarin Enameled Porcelain Plate. 18th C. Cinese Mandarin Enameled Porcelain Plate.